Planning a route is not necessarily as easy as it sounds but it is one of the most important skills in rambling. Choosing the wrong route can take you out of your comfort zone, and can potentially be rather dangerous. 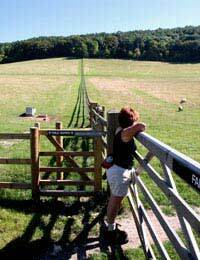 There are several factors that should be involved in planning a rambling route. When planning a rambling route, take into consideration the other group members. This is particularly the case if some members are more experienced than others. Those that have been rambling for years may prefer to go on trickier walks, but these aren't suitable for new ramblers, who need to find their feet before they attempt the more difficult walks. If your group contains ramblers of differing abilities, an "easy" walk is the best option, as everyone should be able to complete it. A less complicated route can also provide an 'exit' if the weather takes an unexpected turn for the worse (and carrying on would pose safety problems). Location can be another deciding factor. You may be planning a casual ramble in the countryside, while another member of your group may be expecting a tough hike through the hills. Sometimes, the weather may take the decision right out of your hands. If its cold and wet with poor visibility, hill and mountain walking is probably best avoided in the interests of safety. If the weather is particularly bad, you might want to postpone the ramble altogether. However disappointing and inconvenient this may be, it's better to be safe than sorry. A rough estimate of how long the ramble should take into account the walking pace of all members of the group. It's no good estimating that the walk should take two hours at a medium walking pace if one or more members of the group walk at a slow pace. The conditions that you'll be walking in will also affect how long the walk takes. It stands to reason that a route involving hills (and other non-flat types of terrain) will take longer to negotiate than a route that is more or less completely flat. The weather can also play a part. Wind and rain can (and usually do) slow you down. Don't forget to factor in rest breaks. If some members of the group start to flag towards the end of the route because they're getting tired, this will inevitably slow everyone else down too. Taking a short break to recharge your batteries can go some way to eliminating this, as it can mean that the last part of the route is walked at a quicker pace than it would otherwise have been. Planning a rambling route obviously requires some prior effort and knowledge, but it's an essential part of rambling. If your preparation is inadequate, you can easily plan a route that is unsuitable for certain members of your group. In the worst case scenario, it could even be dangerous If you don't consult other group members about their preferences, you can easily end up with a ramble that no-one but you enjoys!